Washington Gov. Jay Inslee wants to raise taxes to pay for schools. In the Washington State Legislature's ongoing struggle to fully fund basic education, as mandated by the state Supreme Court's 2012 McCleary decision, Gov. JAY INSLEE has proposed a simple, though controversial, approach: raising taxes. 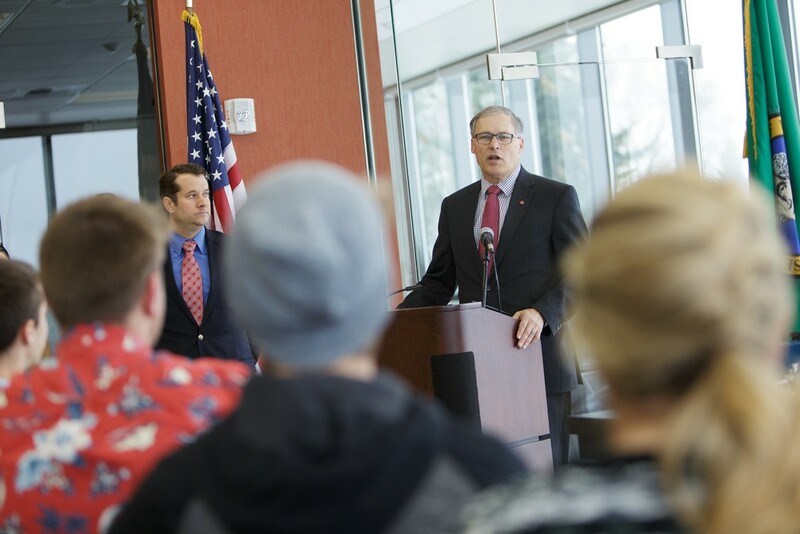 Last week, Inslee released his plan to fund education. It proposes $4 billion in new taxes for the upcoming two-year budget to fund K-12 schools. "We face an opportunity — and an obligation — in this upcoming session to not just put more money into the system than we already have, but to invest in the kind of education system all our children deserve," Inslee said in a statement. His proposal would include money to recruit and retain teachers and would fund positions for school nurses and counselors. It would cut local tax levies that pay for teacher salaries in many districts. Outgoing Superintendent of Public Instruction Randy Dorn, who has been critical of lawmakers for failing to pay for McCleary, called the proposal a "step in the right direction." The incoming state schools chief, Chris Reykdal, also supports the proposal. Sure, the speculation that President-elect Donald Trump would appoint U.S. Rep. Cathy McMorris Rodgers as his Secretary of the Interior flamed out last week. But as of Tuesday, one bit of Inland Northwest political speculation remained alive: The notion that Idaho Gov. C.L. "BUTCH" OTTER would become Trump's Secretary of Agriculture. Last week, outlets including the Spokesman-Review and the Idaho Statesman confirmed that Otter was being vetted for the position. But just as the McMorris Rodgers rumors freaked out environmental groups, animal rights groups expressed serious concerns about the possibility of Otter being picked. In 2014, Otter signed the infamous "ag-gag" bill, intended to punish animal rights activists who secretly film in agricultural facilities with up to a year of imprisonment and a $5,000 fine. Last year, a U.S. District Court Judge for the District of Idaho struck down the law as unconstitutional. It's currently being appealed in the 9th Circuit.